I know that we have some gorgeous fall season temperatures out there this week, but part of me has been turning on the Christmas clock. Part of that is due to some of the stores already getting their decorations out for the winter holiday! ALREADY? What about Halloween??? Just do not turn the music on yet, or I will be without Christmas spirit by Thanksgiving. What I have here is a SIMPLE card. 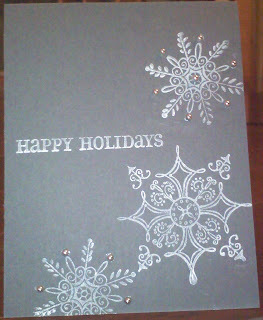 Just basic stamping... sometimes we forget about the simple stuff. ... so I just thought - theses beautiful snowflakes speak for themselves, not alot of glit needed for them. This is another stamp set in the new SU! Holiday Mini Catalog that was just released on Tuesday. I like it!